UPDATE: We just found out that our well will be in the Kaliro region of Uganda. 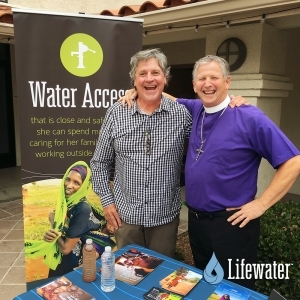 On Sunday, June 5 Holy Trinity welcomed good friend Bobby DeLancellotti as we launched our missional partnership with Lifewater to purchase a well for a rural village impoverished by the lack of a fresh water source. Lifewater is a Christian non-profit that brings clean water and sanitation to rural villages all over the world. Our goal this summer is to raise $6,000 to fund a well in a village without the availability of fresh water. The project will integrate our entire community: adults and children! Families of pre-schoolers, children, and youth are invited to participate in our fundraising goal to purchase one well. To read more about Lifewater, their mission and impact in the world, visit their website. Click here to listen to Bobby’s vision & mission at his visit to our church. Click here to give, and click on Lifewater Well Fund in our directed giving box.